Welcome to our office – the Liverpool, New York dental practice of Dr. Robert Clark, Dr. Michael Romano, Dr. Michael Grossman, Dr. Jarred Smithers, and their dedicated team. For over 35 years, we have provided personalized family and cosmetic dental care to generations of patients and their families. Within our state-of-the-art dental facility, we offer a variety of treatments that improve upon our patients' oral health as well as the beauty of their smiles. Our goal is to give you the care you need, when you need it. With the latest in digital technology and our mix of general, cosmetic, and restorative dental services, we are able to provide each procedure under one roof and ensure your comfort and overall satisfaction. Our goal is to provide a family atmosphere where you can feel right at home. Our patients enjoy our in-office coffee bar and are put at ease with iPads for listening to music or watching movies along with noise cancelling headphones in each operatory. From the moment you step into our Liverpool dental office, you will be greeted and assisted by our friendly receptionist. During your appointment, our gentle hygienist will perform a thorough cleaning in preparation for an examination with either Dr. Clark, Dr. Romano, or Dr. Grossman. You are able to express any concerns you may have with your smile and we will give you options as to the most beneficial treatment plan for your desires and oral health. 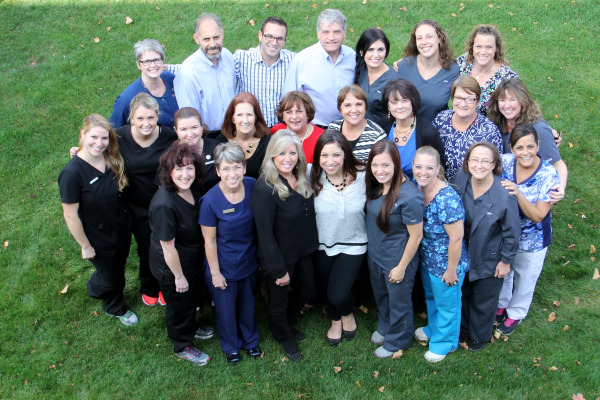 You can expect a warm and caring staff that will actively listen and offer you the best options for your dental needs. If you would like more information about the services we provide, or to schedule an appointment with us in Liverpool, contact the dental health professionals at Summit Dental Group today!